Saturday morning I ran an uneventful 20-miler near Vancouver Lake with the Portland Marathon Clinic’s group run. It was hot and the scenery was mostly blackberries and corn, but there were lots of nice people to talk to and plenty of aid stations. It was probably the easiest 20-miler I can recall. I had a little ankle soreness afterward, but it went away the next day. With 10 weeks left before the Portland Marathon and a lot more long runs of 20 miles or more on the schedule, I should be in solid shape, endurance-wise. This morning I ran six miles before work. This is very unusual for me, but it’s going to be near 100 degrees tonight and something needed to be done. Trying to push myself to keep the speed up while I’m alone and sleepy was a challenge. I ran the usual six miles last night in what I think was the hottest weather yet this year: low to mid 90s, no wind at all, and a bit humid. It was a serious struggle. My legs started out pretty dead feeling. I guess it was delayed soreness and stiffness from Saturday’s 19. After a few miles, my legs warmed up but the heat was just murderous. I found myself trying to sprint through the sunny bits of the trail and linger in the shaded portions. I found myself cursing the fact that such heat training has little practical training effect. The only good news was that the pace I was running was actually faster than the pace I felt like I was running. The run finished up with a 7:50/mile average pace. I was glad that the Portland Marathon Clinic‘s free group run this Saturday was on a nice flat route. At 19 miles long, this run was going to create a high-mileage week for me. Last week’s run had been a fairly hilly Forest Park trail run, and Thursday’s workout had been on steep hills as well. The run was an out and back from 12th and Couch in the Pearl district, down to the river and across the Steel Bridge, then south on the Esplanade and the Springwater. I switched to the 3:20 pace group this time, but they still went pretty slowly; a 9:20 average pace. It was a surprisingly comfortable run. It was hot, even early in the day, but I kept hydrated and didn’t wilt at all. Oh boy! A graph! About running! Race paces, adjusted to "equivalent" 5K pace. Click image to see full size. The results as a whole are surprisingly linear looking. I’ve been gaining somewhere around 45 seconds a mile per year for the last two and a half years. 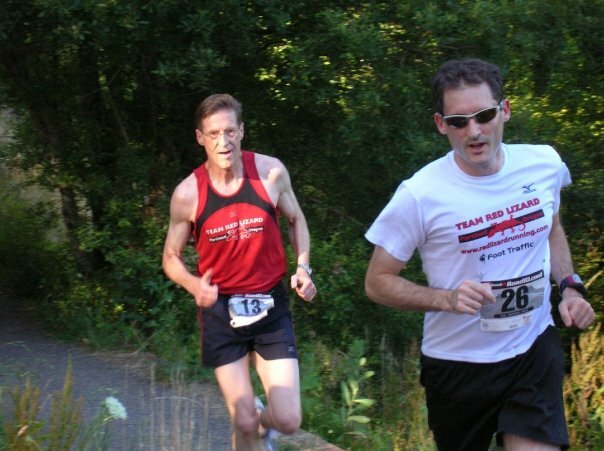 The rate of improvement slowed after May 2008 (plantar fasciitis limited my training) and I seemed to slow even further during my mostly-on-trail training over the winter after that, but my spring and summer roadwork appears to have put me back on the same approximate slope. After waiting for everyone to finish the race portion, we continued over to Pittock Mansion where we had CAKE! All runs should have cake in the middle. My unexpected performance at the flat half has upset those fine-sounding plans. According to my favorite race performance calculator, with adequate training and under the same conditions, I should be able to run a 3:13 marathon. Now, the conditions won’t be the same: the Portland marathon course isn’t flat. The early hills and the nasty ups and downs around the bridge at mile 18 can and will take their toll, as can the big downhill during mile 23. But, still. 3:13! I can’t not go for the BQ. Right now, I find it scary to go for something that aggressive compared to my previous marathons. I’ve put on a surge of speed over the last four months and I’m still not completely settled down when it comes to training and running at the appropriate paces for that speed. Put another way, I’ve done few enough training runs at a 7:30 pace or faster that it’s intimidating to think of going 26.2 at that speed. Portland’s still a long way off. I still have 80 days left to train or to get injured, whichever comes first. I’ll be re-evaluating my pace goal again before the big day. But for now, 3:20 is my line in the sand. *A 3:20 will get me into the 2011 Boston Marathon, when I’ll be 40. 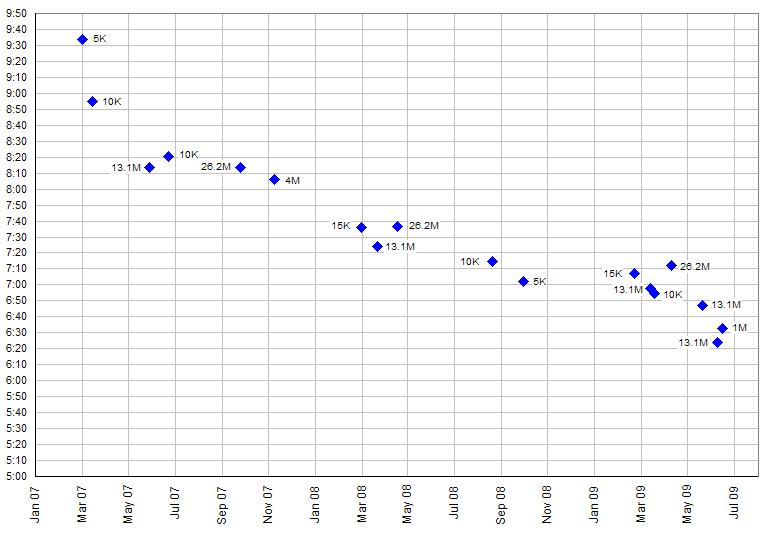 To qualify for the April 2010 Boston Marathon, when I’ll still be 39 — by a month — I’d actually need to run a 3:15. There’s an 18 month window for qualifying, so a 3:15 now would technically qualify me for both 2010 and 2011. My plans to do the Goose Run regularly this summer haven’t been off to a good start. Last week, out-of-town guests were arriving just as the run was to start. This week, the regular Goose was on hold for stages one and two of the Red Lizard’s tongue-in-cheek Tour de Goose. Stage one was a “Guillotine Mile.” One mile on the Lincoln High track, starting as late as your dare while still finishing before the time limit expires and the ceremonial guillotine falls. I picked six minutes as my time limit. The running calculator says I should have a 5:44 in me, but that’s based on a half-marathon time, which I think is my best distance. Four people started at the six-minutes-left time and I settled into second place among them. Racing one mile is hard. After the first (too fast) lap, it felt like a gasping asthma attack for the rest of the way. I lost some steam in laps three and four, but still gasped my way across the finish line in 5:52, eight seconds ahead of the guillotine. You are currently browsing the I'd Rather be Running blog archives for July, 2009.